I am making or should I say attempting to make the girls a shirt for our family pictures this weekend. This is my first time making sleeves. Gweniveve picked out this print from Park Slope since blue is her favorite color. I am using a print from Farmdale for Penelope's. 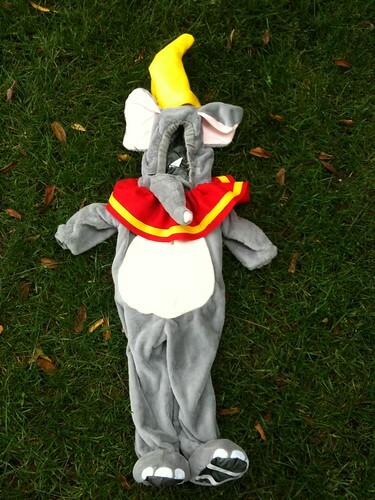 I made the hat & collar to complete the elephant costime transformation into Dumbo for Gweniveve for Halloween. It turned out great except as you can see I made the hat really large. Hats are hard to decide on the right size. We had tons of fun trick or treating even though it seemed like the girls were the only ones out. Penelope was a flower gnome which we thought was just to cute not to buy so I didn't end up making her anything for Halloween. these look great! Nice work! 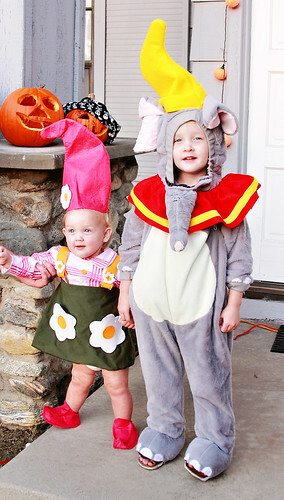 We don't celebrate Halloween but wow!...these are really cute costumes! My husband's birthday is on 31st itself so we celebrate that. Warm wishes from Tokyo! Sleeves aren't too hard. 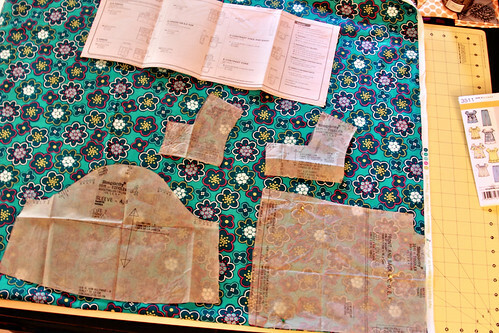 But whatever the pattern says, do what you can to sew the sleeves onto the bodice before you sew up the sides of the bodice. And hem the sleeves first. Little sleeves are a pain. I can't wait to see hoe the blouses turn out! Very cute halloween costumes. 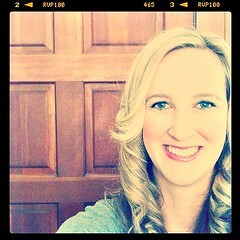 PS I'm having my first little giveaway over at my blog - would love for you to stop by. thx! !